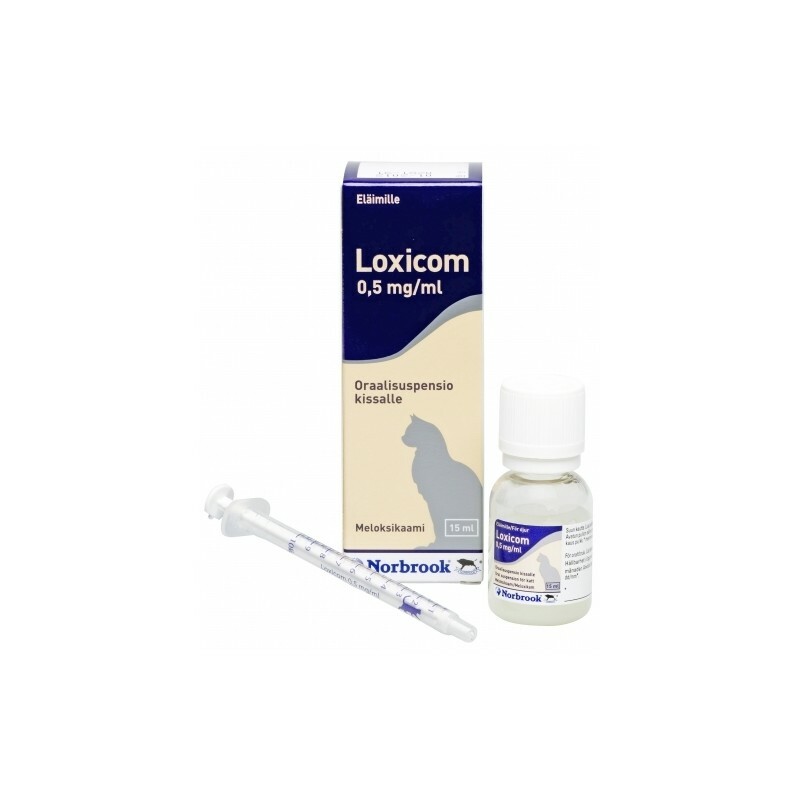 Loxicom for Cats may only be supplied with a valid veterinary prescription issued by your vet. 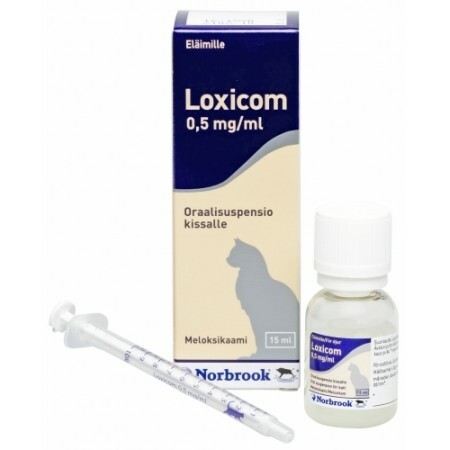 You should only purchase Loxicom if you have or are in the process of arranging such a prescription. See information bar for further details. Admin: Initial treatment is a single dose of 0.2mg meloxicam/kg bodyweight (i.e.1.33ml/10 kg bodyweight) on the first day. Treatment is to be continued once daily by oral administration (at 24 hour interval) at a maintenance dose of 0.1mg meloxicam/kg bodyweight (i.e. 0.667ml/10kg bodyweight). For longer term treatment once clinical response has been observed (after = 4 days) the dose can be adjusted to the lowest effective individual dose reflecting that the degree of pain and inflammation associated with chronic musculo-skeletal disorders may vary over time. Particular care should be taken with regard to the accuracy of dosing. Please carefully follow the instructions of the veterinarian. For oral use. To be administered with food or directly into the mouth. shake well before use. The suspension can be given using either of the two measuring syringes provided in the package. The syringes fit onto the bottle and have a kg-bodyweight scale which corresponds to the maintenance dose (i.e. 0.1mg meloxicam/kg bodyweight). Thus for initiation of the therapy on the first day twice the maintenance volume will be required. Alternatively therapy may be initiated with Loxicom 5mg/ml solution for injection. A clinical response is normally seen within 3-4 days. Treatment should be discontinued after 10 days at the latest if no clinical improvement is apparent. Avoid introduction of contamination during use. Do not use in pregnant or lactating animals.Do not use in animals suffering from gastrointestinal disorders such as irritation and haemorrhage impared hepatic cardiac or renal function and haemorrhagic disorders.Do not use in case of hypersensitivity to the active substance or to any of the excipients.Do not use in dogs less than 6 weeks of age.Typical adverse reactions of non-steroidal anti-inflammatory drugs (NSAIDs) such as loss of appetite vomiting diarrhoea faecal occult blood apathy and renal failure have occasionally been reported. These adverse reactions occur generally within the first treatment week and are in most cases transient and disappear following termination of the treatment but in very rare cases may be serious or fatal.If adverse reactions occur treatment shoud be discontinued and the advice of a veterinarian should be sought. Avoid use in any dehydrated hypovolaemic or hypotensive animal as there is a potential risk of renal toxicity.Other NSAIDs diuretics anticoagulants aminoglycoside antibiotics and substances with high protein binding may compete for binding and thus lead to toxic effects.Loxicom must not be administered in conjunction with other NSAIDs or glucocorticosteroids. Pre-treatment with anti-inflammatory substances may result in additional or increased adverse effects and accordingly a treatment-free period with such veterinary medicinal products should be observed for at least 24 hours before commencement of treatment. The treatment-free period however should take into account the pharmacokinetic properties of the products used previously.In the case of overdose symptomatic treatment should be initiated. Operator Warnings: User precautions: People with known hypersensitivity to NSAIDs should avoid contact with the veterinary medicinal product.In case of accidental ingestion seek medical advice immediately and show this package leaflet or the label to the physician.Medicines should not be disposed of via wastewater or household waste. Product Storage: Shelf-life after first opening the container: 6 months.Do not use after the expiry date stated on the carton and the bottle.This veterinary medicinal product does not require any special storage conditions. Product Disposal: Ask your veterinary surgeon how to dispose of medicines no longer required. These measures should help to protect the environment.Keep out of the reach and sight of children.For animal treatment only.